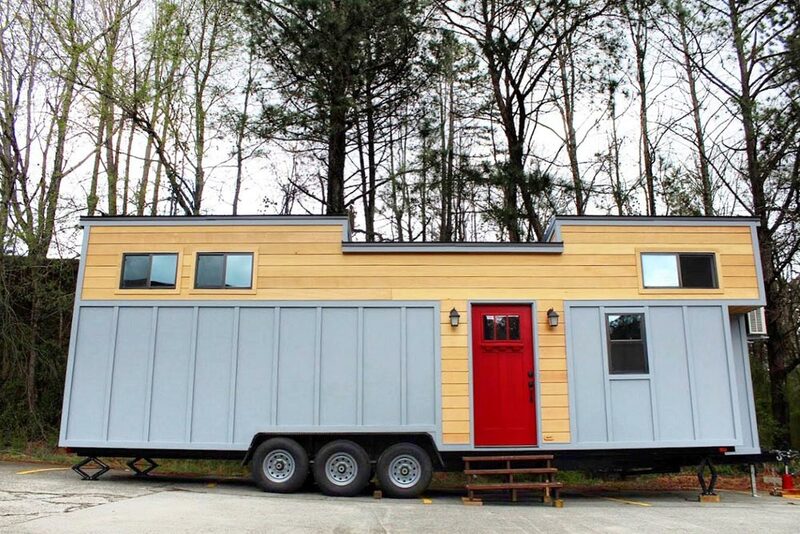 Juniper is a wonderful tiny house built by Mustard Seed Tiny Homes. The interior includes a built-in entertainment center and L-shaped couch. Storage stairs provide several storage spaces and lead up to the main bedroom loft. In the loft is a beautiful custom headboard, nightstands, and bed platform with storage. Across the house is an additional bedroom/storage loft with ladder access. The kitchen has a white apron sink, freestanding gas range with venting hood, and refrigerator. A pocket door leads into the bathroom where you’ll find room for a washer/dryer combo, teal green vanity, corner glass shower, and flush toilet. Also available from Mustard Seed Tiny Homes: Sprout, Cypress, Everest.